Sondra Sneed is a psychic medium who channels Source intelligence, to perform Soul Readings and Source Talks around the country and for dedicated clients and students around the world. She is a published Godscribe and spiritual advisor via online and print media, contributing spiritual advice for listeners on radio call-in shows and podcasts. Sneed has performed over 2,500 soul readings for clients of her private practice, since going public in 2014 with her psychic gifts. She writes a spiritual column about true love for Texas Weddings magazine. 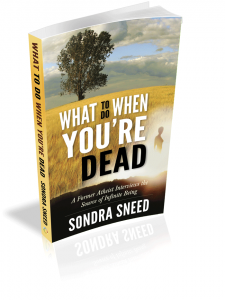 Sneed is also the author of What to Do When You’re Dead; A Former Atheist Interviews the Source of Infinite Being which was published by Robert Friedman, Rainbow Ridge Books (2014), notable for having also discovered Neale Donald Walsch, author of Conversations With God series in 1995.